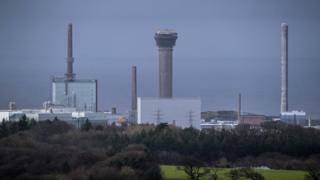 Firefighters at the Sellafield nuclear reprocessing plant in Cumbria have begun the first of two strikes in a dispute over pay. A 12.5-hour walkout by 63 members of the GMB union got under way at 06:00 BST. A further strike is scheduled for 19 October. Sellafield said it was "unprecedented the GMB union hasn't ensured safe levels of firefighters will be on shift during today's industrial action". It added it had made arrangements for private sector firefighters, who had undergone specific training, to work at the site during the strikes. The union's Chris Jukes said Sellafield Ltd management had shown a "steadfast refusal to recognise the efforts and skills" of workers with staff feeling "insulted".